Why You Should Avoid DIY Home Alarm Systems | Calgary Alarm Inc. 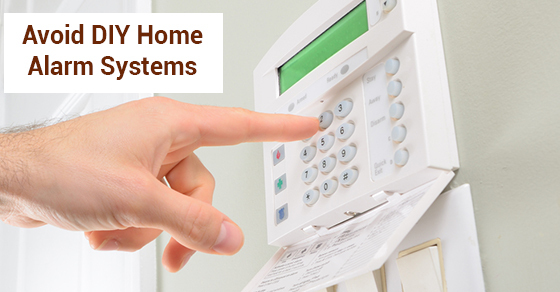 There are many reasons you may consider a DIY home alarm system. They are widely available at stores, and are an inexpensive option for those who want to ramp up their home security while saving money. While there are many effective DIY home alarm systems available, they are also difficult to install, and if installed improperly they can make it even easier for burglars to enter your house. Limited Detection Range: Wireless devices have a maximum range that they can be placed in in order to sync with and work within the security system. If these wireless sensors are not properly placed within range, they will not work. Battery Check: Many people forget to check the batteries on their home appliances, including their DIY alarm systems, and don’t realize the batteries have died until it is too late. Physical Barriers: Furniture and other physical barriers in your home can block wireless signals between sensors. If you are inexperienced in installing home alarm systems, you may not be able to gauge where these physical barriers will impede your alarm system. A big advantage of having a home alarm system professionally installed is that you know it is being installed by someone with experience, who has done this many times before. They will know where the best places to install sensors are, as well as what areas are at higher risk for burglary entry. Another advantage, and probably the most significant one, is that professionally installed alarm systems usually come with an alarm monitoring system as well. A monitored home alarm system will contact emergency services as soon as it is triggered. In case of an emergency, such as a fire or a break-in, you may not be able to phone the police, or may be delayed. Home alarm monitoring provides you with the most possible safety. This can also include two-way voice activation so that you can communicate with the dispatcher once the alarm has been triggered. While DIY home alarm systems may be tempting, there is no substitution for the skill and experience offered by a professional company. Especially if you have children, or live with elderly relatives, pets or people who are less physically able, your alarm system should be specially adapted and installed with this in mind. A home alarm system should provide the maximum amount of safety and security for you, your family and your home.